Auchentoshan is seeking bartenders from around the world to be part of the ‘New Malt Order’ – a competition offering the chance to create a new limited edition whisky for the brand. Accompanied by the tagline ‘Welcome to the New Malt Order’, Auchentoshan will select 240 entrants from five countries who will be challenged to create their own bitters using Auchentoshan new make spirit. Using a New Malt Order Bitters Kit, each bartender will then be required to showcase their ability to ‘challenge the norms’ by putting a twist on the brand’s signature cocktail, Auchentoshan & Ale. The final 12 will form the ‘New Malt Order’ and will be responsible for selecting casks for the limited edition Auchentoshan The Bartender’s Malt, as well as designing the packaging, ready to be released across bars in 2017. Rachel Barrie, Auchentoshan master blender, said: ‘Auchentoshan’s New Malt Order is an exciting opportunity for bartenders across the world to show us how they do things differently. ‘The New Malt Order is synonymous with what the bartending community strives to achieve – a collaboration of innovators inspired not just by food and drink, but also by the cultural areas of music, art and literature. 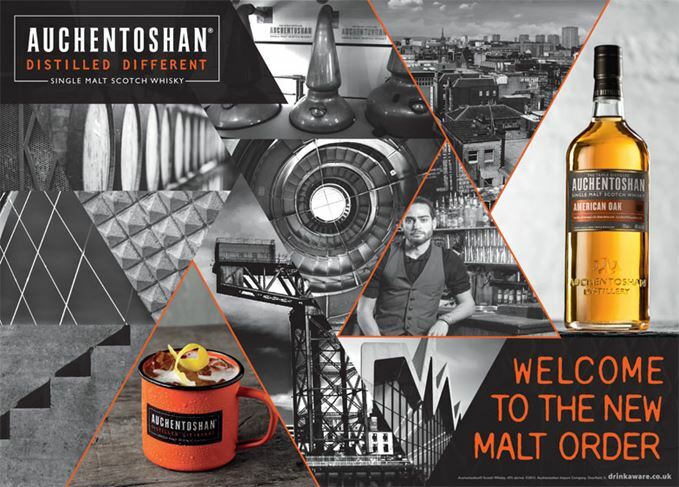 The New Malt Order competition coincides with the launch of Auchentoshan’s ‘Distilled Different’ campaign, which highlights its position as the only triple-distilled single malt whisky, as well as the mixability of single malts. Further details can be found at www.newmaltorder.com. Twelve bartenders have created a single malt whisky designed to be mixed in cocktails. Is single malt still synonymous with Scotch? How can single malt be inherently Scottish if so many countries are producing their own? Can single malt whiskies be ‘too young’? The minimum maturation age for Scotch is three years – but is that enough for single malts? A poorly worded press release has Dave Broom considering Scotch whisky’s individuality. With Thanksgiving approaching, our hapless Whisky Virgin sets out to learn about American whiskey.